Modern, spacious and luxurious newly built dormer bungalow on its own private grounds with secure parking. 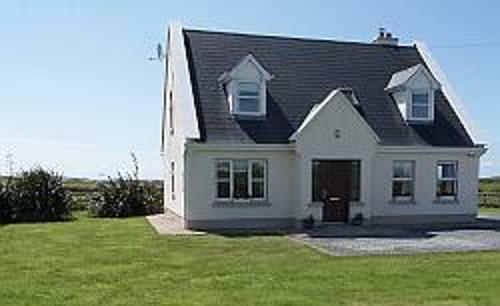 Located in a rural setting on a quiet country road just outside the fishing village of Quilty and less than 5 minutes from Spanish Point and Miltown Malbay. 3 Bedrooms located upstairs, one of which is en suite and the main family bathroom. Downstairs you have the 4th bedroom en suite. There is an open plan modern kitchen with Electric Cooker, and dining area, solid fuel stove and off this there is a sun room with triple aspect – drenched with sunlight right through the afternoon and evening, with incredible views over Mutton Island and the Atlantic sea and Tromra Castle. Cot, High Chair and Stair Gate all available. Oil central heating charged at €7 per day June – September and €5 rest of the year. Electricity is meter read. Directions: From Milton Malbay – follow the road to Spanish Point – pass the Bellbridge Hotel on your right hand side, continue for 3km to Quilty and pass through keeping on the main road. About 1km ahead turn right at a cross road continuing up this country lane for 300m. Turn right at Dalys Bar and the property is the second house on the right hand side.